Example of commodities that have been used as mediums of exchange include gold, silver, copper, salt, peppercorns, tea, large stones (such as Rai stones), decorated belts, shells, alcohol, cigarettes, cannabis, candy, cocoa beans, cowries and barley. These items were sometimes used in a metric of perceived value in conjunction to one another, in various commodity valuation or price system economies. Since payment by commodity generally provides a useful good, commodity money is similar to barter, but is distinguishable from it in having a single recognized unit of exchange. (Radford 1945) described the establishment of commodity money in P.O.W camps. People left their surplus clothing, toilet requisites and food there until they were sold at a fixed price in cigarettes. Only sales in cigarettes were accepted – there was no barter [...] Of food, the shop carried small stocks for convenience; the capital was provided by a loan from the bulk store of Red Cross cigarettes and repaid by a small commission taken on the first transactions. Thus the cigarette attained its fullest currency status, and the market was almost completely unified. Radford documented the way that this 'cigarette currency' was subject to Gresham's law, inflation, and especially deflation. In another example, in US prisons, after smoking was banned circa 2003, commodity money has switched in many places to cans or foil pouches of mackerel fish fillets, which have a fairly standard cost and are easy to store. These may be exchanged for many services in prisons where personal possession of currency is prohibited. In situations where the commodity is metal, typically gold or silver, a government mint will often coin money by placing a mark on the metal that serves as a guarantee of the weight and purity of the metal. In doing so, the government will often impose a fee which is known as seigniorage. The role of a mint and of coin differs between commodity money and fiat money. In situations where there is commodity money, the coin retains its value if it is melted and physically altered, while in a fiat money it does not. Usually in a fiat money the value drops if the coin is converted to metal, but in a few cases the value of metals in fiat moneys have been allowed to rise to values larger than the face value of the coin. In India, for example fiat Rupees disappeared from the market after 2007 when their content of stainless steel became larger than the fiat or face value of the coins. In the US, the metal in pennies (97.5% zinc since 1982, 95% copper in 1982 and before) and nickels (75% copper, 25% nickel) has a value close to, and sometimes exceeding, the fiat face value of the coin. In the sparsely settled American colonies, money, as it always does, arose in the market as a useful and scarce commodity and began to serve as a general medium of exchange. Thus, beaver fur and wampum were used as money in the north for exchanges with the Indians, and fish and corn also served as money. Rice was used as money in South Carolina, and the most widespread use of commodity money was tobacco, which served as money in Virginia. The pound-of-tobacco was the currency unit in Virginia, with warehouse receipts in tobacco circulating as money backed 100 percent by the tobacco in the warehouse. Other animal furs were convertible into beaver pelts at a standard rate as well, so this created a viable currency in a primitive economy with limited supplies of gold, silver, and other kinds of money, but numerous fur-bearing animals. The Fort Knox gold repository long maintained by the United States, functioned as a theoretical backing for federally issued "gold certificates" to substitute for the gold. Between 1933 and 1970 (when the U.S. officially left the gold standard), one U.S. dollar was technically worth exactly 1/35 of a troy ounce (889 mg) of gold. However, actual trade in gold bullion as a precious metal within the United States was banned after 1933, with the explicit purpose of preventing the "hoarding" of private gold during an economic depression period in which maximal circulation of money was desired by influential economists. This was a fairly typical transition from commodity to representative to fiat money, with people trading in other goods being forced to trade in gold, then to receive paper money that purported to be as good as gold. Cigarettes and gasoline were used as a form of commodity money in some parts of Europe, including Germany, France and Belgium, in the immediate aftermath of World War II. Cigarettes are still used as a form of commodity money in U.S. prisons (Lankenau 2001, p. 142 concludes that where jails don't ban them, the prison "gray market" creates a use of the cigarette as "currency"). Although some commodity money (barley) has been used historically in relations of trade and barter (Mesopotamia circa 3000 BC), it can be inconvenient to use as a medium of exchange or a standard of deferred payment due to transport and storage concerns, and eventual rancidity. Gold or other metals are sometimes used in a price system as a store of perceived value that does not break down due to environmental deterioration and that can be easily stored (demurrage). 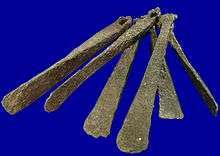 The use of barter like methods using commodity money may date back to at least 100,000 years ago. Trading in red ochre is attested in Swaziland, shell jewellery in the form of strung beads also dates back to this period, and had the basic attributes needed of commodity money. To organize production and to distribute goods and services among their populations, before market economies existed, people relied on tradition, top-down command, or community cooperation. Relations of reciprocity, and/or redistribution, substituted for market exchange. The city-states of Sumer developed a trade and market economy based originally on the commodity money of the Shekel which was a certain weight measure of barley, while the Babylonians and their city state neighbors later developed the earliest system of economics using a metric of various commodities, that was fixed in a legal code. Several centuries after the invention of cuneiform, the use of writing expanded beyond debt/payment certificates and inventory lists to codified amounts of commodity money being used in contract law, such as buying property and paying legal fines. Today, the face value of specie and base-metal coins is set by government fiat, and it is only this value which must be legally accepted as payment for debt, in the jurisdiction of the government which declares the coin to be legal tender. The value of the precious metal in the coin may give it another value, but this varies over time. The value of the metal is subject to bilateral agreement, just as is the case with pure metals or commodities which had not been monetized by any government. As an example, gold and silver coins from other non-U.S. countries are specifically exempted in U.S. law from being legal tender for the payment of debts in the United States, so that a seller who refuses to accept them cannot be sued by the payor who offers them to settle a debt. However, nothing prevents such arrangements from being made if both parties agree on a value for the coins. ↑ O'Sullivan, Arthur; Steven M. Sheffrin (2003). Economics: Principles in action. Upper Saddle River, New Jersey 07458: Pearson Prentice Hall. p. 246. ISBN 0-13-063085-3. ↑ Radford, R.A. (1945). "The Economic Organisation of a PoW Camp". Economica. Retrieved 2009-05-09. .
↑ "Mackerel Economics in Prison Leads to Appreciation for Oily Fillets: Packs of Fish Catch On as Currency, Former Inmates Say; Officials Carp". The Wall Street Journal. October 2, 2008. ↑ Oconnor, Ashling (June 16, 2007). "Coins run out as smugglers turn rupees into razors". The Times. London. Retrieved April 30, 2010. ↑ "The Fur Trade and Hudson's Bay Company". Retrieved 2015-01-05. ↑ "Troublesome in Europe: Black Markets". Leader-Post. Regina, Saskatchewan. 1946-01-05. Retrieved 2012-11-28. ↑ Charles F. Horne, Ph.D. (1915). "The Code of Hammurabi : Introduction". Yale University. Retrieved December 8, 2015. ↑ Dow, Sheila C. (2005). "Axioms and Babylonian thought: a reply". Journal of Post Keynesian Economics. 27 (3): 385–391. Lankenau, S.E. (2001). "Smoke 'Em If You Got 'Em: Cigarette Black Markets in U.S. Prisons and Jails". The Prison Journal. 81 (2): 142–161. doi:10.1177/0032885501081002002. PMC 2117377 . PMID 18064295. Radford, R. A. (November 1945). "The Economic Organisation of a P.O.W Camp". Economica. Blackwell Publishing. 12 (48): 189–201. doi:10.2307/2550133. JSTOR 2550133. Commodity Money: Introduction, about commodity money in the early American colonies.